The physical properties of composites are fiber dominant. This means that when the resin and fiber are combined, their performance remains most like the individual fiber properties. Test data shows that the fibrous reinforcement is the component carrying the majority of the load. For this reason, fabric selection is critical when designing composite structures. Begin the process by determining the type of reinforcement needed in the project. The average fabricator can choose from three common reinforcements: fiberglass, carbon fiber, and Kevlar®. Fiberglass tends to be the all-purpose choice, while carbon fiber offers high stiffness and Kevlar®, high abrasion resistance. Our revised "Fundamentals of Fiberglass" white paper includes more fabric selection information for your reference. Customers requiring specific testing information should consult our laminate comparison table. This table should help you select the proper material when the stress load of your parts is known in advance. Keep in mind that fabric types may be combined in the laminate forming a hybrid lay-up with the benefits of more than one type of material. Once the family of fabric has been determined, select the weight and weave style which suits the demands of the job. The lighter the ounce-weight of the fabric, the easier it will be to drape over highly contoured surfaces. Lightweights also use less resin so the entire laminate remains lighter. As fabrics become heavier, they become less flexible. The medium weights retain enough flexibility to drape over most contours and they contribute significantly to the strength of the part (6-, 7.5-, and 10-ounce fabrics are our most popular). They are very economical and produce strong and lightweight parts used in automotive, marine, and industrial applications. Woven roving is the heaviest reinforcement and is typically used in boat building and mold construction. The way the fabric is woven is considered its pattern or style. Choose from three common weave styles: plain, satin, and twill. Plain-weave styles are the least expensive and least pliable, but they hold together well when cut. The frequent over/under crossing of the threads reduces the strength of the plain weaves, although they are still adequate for all but the highest performance applications. Satin and twill weaves are highly pliable and stronger than plain weaves. In a satin weave, one filling yarn floats over three to seven other warp threads before being stitched under another warp fiber. Threads run straighter much longer in this loosely woven type, maintaining the theoretical strengths of the fiber. Twill weaves offer a compromise between satin and plain styles, as well as an often desirable herringbone cosmetic finish. To increase the pliability of any fabric, cut it off the roll on a bias of 45 degrees. Even the coarsest fabric will drape better over contours when cut this way. Fiberglass is the foundation of the composites industry. It's been used in many composites applications since the 1950's and its physical properties are pretty well understood. Fiberglass is lightweight, has moderate tensile and compressive strength and is tolerant of both damage and cyclical loading, as well as being easy to handle. Fiberglass is the most widely used out of any composite material available. This is mainly due to its relative low cost, and moderate physical properties. Fiberglass is perfect for every day projects and parts that are not expect to need the added strength and durability of the higher priced fabrics. To maximize strength properties of the carbon, it should be used with an epoxy resin, and can be cured using standard lamination techniques (no special tools or methods are required). 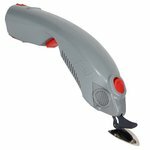 It is ideally suited for applications in the auto, marine, and aerospace industries, and is often used for sporting goods. 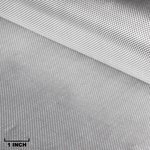 4 oz Fiberglass Fabric This 4-ounce plain weave fiberglass fabric is a popular selection for use as a surface fabric, with enough body to easily be handled. It will provide a uniform strength in both horizontal and vertical directions. This fabric comes in 50" width. 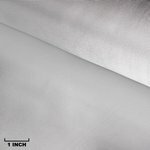 7-1/2 oz Fiberglass Fabric One of the most popular fiberglass fabrics in the industry, the 7-1/2 ounce fabric is a favorite for waterproofing and protecting various marine applications, like boats and personal watercraft. This fabric comes in 38" and 50" widths. Style 7781 E-Glass Style 7781 is a satin weave fabric, which are frequently used for aerospace and structural applications, offering excellent strength and surfacing characteristics. This fabric comes in a 38" and 50" widths. Kevlar® was one of the first high-strength synthetic fibers to gain acceptance in the fiber-reinforced plastic (FRP) industry. Composites-grade Kevlar® is lightweight, has excellent specific tensile strength, and is touted for being highly impact and abrasion resistant. Common applications include lightweight boat hulls like kayaks and canoes, aircraft fuselage panels, and pressure vessels. Kevlar® should be used with an epoxy or vinyl ester resin. Kevlar® can be difficult to cut, sand, and machine, and is not suited for applications requiring compressive strength. Use a separate pair of scissors to cut Kevlar® because glass fabrics wear scissors at a different cutting angle than Kevlar®. The same pair of scissors can be used to cut both glass and graphite. Kevlar Twill Weave Fabric This Kevlar Fabric is ideal for impact resistant applications that call for excellent specific tensile strength and minimum weight. The twill weave patternfor improved drapability and cosmetics. This fabric comes in a 50" width. Kevlar Plain Weave Fabric A popular Kevlar Fabric, the Kevlar Plain weave will offer more uniform properties when compared to the twill weave fabric. It is a great choice for projects requiring good stiffness, light weight and simple surfacing characteristics. This fabric comes in a 50" width. Kevlar Carbon Fiber Hybrid A mixture of the best in both Kevlar and Carbon Fiber, this fabric combines the properties of the two fibers in each layer to deliver high strength-to-weight ratio, high confomrability, impact resistance, abrasion resistance, dimensional stability, and fatigue resistance. Graphite fibers contain up to 95% carbon and yield the highest ultimate tensile strength in the FRP industry. That's the force required to pull both ends of any length until it breaks. In fact, they boast the greatest compressive strength and flexural, or bend, strength in the industry, as well. When processed, these fibers combine to create carbon fiber reinforcement, like fabric, tow, and sleeve. These reinforcements deliver the highest strength- and stiffness-for-weight in the industry - more than any other common reinforcement and even most traditional building materials. Carbon fiber also delivers desirable sleek, black cosmetics. Carbon fiber is generally more expensive than other reinforcements. And, once you reach the ultimate strength of carbon fiber, there is no yield: it will fail suddenly and snap, or splinter. 3k, Plain Weave For lightweight, aerodynamic parts, this plain weave carbon fiber is a commonly selected style, delivering uniform strength in both vertical and horizontal directions. This plain weave is 50" and 60" widths. 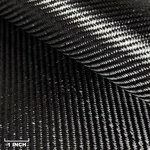 3k, 2 x 2 Twill Weave Our single most popular carbon fiber fabric, with a signature appearance that is highly desirable for modern composite parts. Twill Weave offers greater conformability and a slight edge in strength, when compared to plain weave counterparts. Twill weave is carried in 50" and 60" widths. 1k, Plain Weave This fabric is often used in the most demanding applications, which all for maximum strengh and stiffness, and where minimum weight justifies the added cost. The 1k Plain Weave carbon fiber is carried in 42" width.